Whenever we come across the term ‘thermometer’ we think of those small devices that are placed in our mouth or on our forehead to measure body temperature. Such thermometers are used for medical purposes, and hence, are known as medical thermometers. Though these thermometers are highly effective in measuring the body’s temperature, they are not useful to measure the temperature of other surfaces or objects. It is because they have limited measurement range and are contact devices. But what if you have to measure the temperature of an object from a certain distance? It is impossible for medical thermometers to cater us in this regard. Hence, here comes the ultimate solution – Infrared thermometers. Infrared thermometers are devices that allow measuring the temperature of surfaces or objects from a distance. Whether it is plastic or metal, the thermometer can measure the temperature of all kinds of surfaces and objects. An infrared thermometer is ideal to measure the temperature of a surface or an object without being in direct contact to it. Every object in this world radiates thermal energy. The hotter an object is, the more thermal energy it possesses. Infrared thermometers are equipped with detectors that transform this thermal energy into electronic signals, which can be read on a screen in less than a few seconds. Most of the advanced infrared thermometers use a laser pointer to measure the exact temperature of a targeted object. The high speed and excellent versatility make infrared thermometer an essential product for numerous industrial, commercial, and home applications. There are situations when contact thermometers and probes may deliver more accurate results than their infrared equivalent. But there are certain situations where non-contact equipment are the best. Infrared thermometers are the best solution to measure the temperature of objects that cannot be touched, something that is too far away or too hot. A large number of people working in manufacturing, mining, or construction industry use infrared thermometers on a regular basis. It is because they frequently have to interact with hazardous objects, like electrical equipment, degreasing units, molten metal, and more. A common use of an infrared thermometer is to measure the temperature of moving things. It includes items on a conveyor belt, specifically inside manufacturing plants. In addition to this, these are great tools to measure the temperature of living organisms like animals. You can also use an infrared thermometer to measure the temperature of food. They are useful to measure food that risks of contamination. For this reason, infrared thermometers are highly valuable tools for food manufacturers and health inspectors. The thermometers can also be used to measure temperatures of foods that are difficult to puncture with the probes. These thermometers are also highly useful in the house. They can be used for air conditioner ducts, check the surface of a grill, barbeque, and more. Infrared thermometers are highly useful devices. So, if you too are looking for such a device then check the best ten infrared thermometers right here. 1 How does an Infrared Thermometer work? 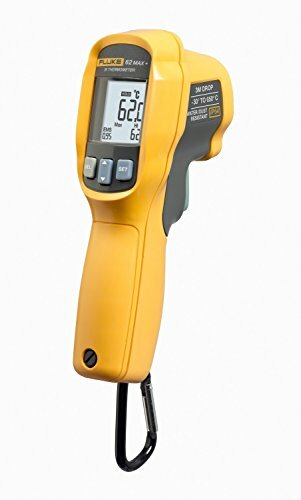 The Fluke 62 Max has earned the first position in our list of best infrared thermometers. It is a premium grade non-contact thermometer that uses dual lasers to offer you complete control over the surface temperature being monitored. Just like Fluke’s exceptional Multimeter line, the thermometer holds superior quality and key attention to detail. It can measure a temperature range from -22 to +1202 Degrees Fahrenheit with a brilliant accuracy rate. The tool is an excellent choice for those who wish to check the temperature difference between two objects in a quite close proximity. It uses two AA batteries, which are economical to replace. Additionally, it has the option to use rechargeable batteries. While the backlit allows convenient reading of the measurement, display lives for a short time of just 5 seconds. Moreover, you need to set the thermometer emissivity correctly in order to get relatively accurate temperature readings. 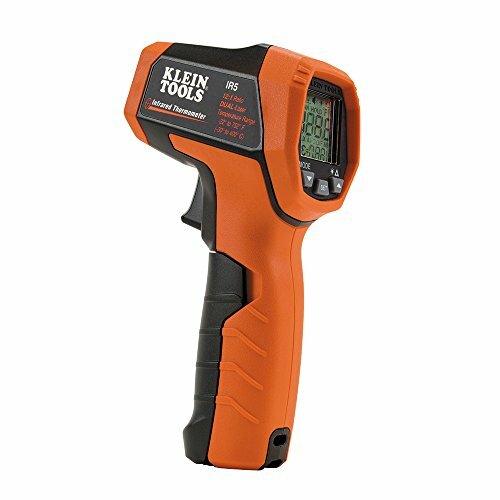 With an optical resolution of 12:1, the Kelin Tools IR5 Dual Laser is the second best infrared thermometer in our list. It comes with dual laser targeting that delivers highly accurate temperature readings than what is obtained from a single laser thermometer. It can measure temperature from -22 Degrees to 752 Degree Fahrenheit. The thermometer comes with adjustable emissivity feature as well as auto-scan functionality. In addition to this, you get a backlit display and an alarm-equipped in the infrared thermometer. It powers off automatically when not in use. There is also a feature of drop protection, which is good for 6.6 feet. The tool gathers power from one nine-volt battery and offers continuous use. The battery offers life-long expectancy of around 10 hours. This product offers a wide measurement range and is ideal for numerous professional applications. For this reason, the thermometer can be used to measure the temperature of most of the surfaces and objects. PROFESSIONAL FEATURE-LOADED IR THERMOMETER AT A FRACTION OF THE PRICE: Scan & Hold. Hi and Lo Alarm. Min, Max, and Average display. Dual lasers and adjustable emissivity for increased accuracy. Even has hands free mode! Large display with bright backlight is easy to read in any lighting. But don't be fooled by look-alikes - only ennoLogic units get tested and packed in the USA, comply with FDA and FCC, and are backed by our 10 YEAR WARRANTY. 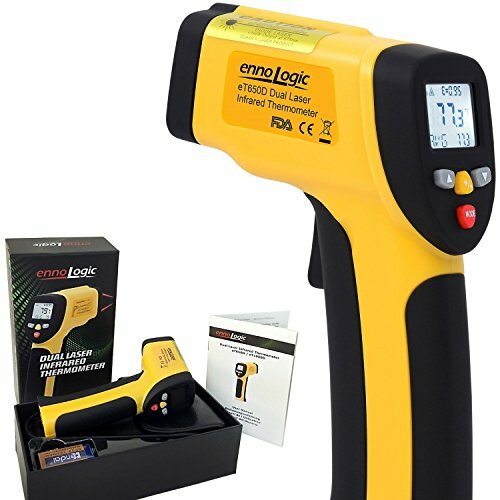 The Ennologic ET650D is a non-contact, dual laser infrared thermometer that is perfect to measure the temperature of an object from a certain distance by sensing its radiated infrared energy. It is one of the finest infrared thermometers packed with numerous exceptional features. For this reason, it can efficiently serve multiple industrial and home applications including cooking pizza, chocolate making, refrigeration, food safety, metalworking, forging, automotive, soap making, pool, HVAC, A/C, and more. The thermometer measure surface temperatures from -58 Degrees to 1202 Degrees Fahrenheit with a high accuracy result. It can scan minimum, maximum, and average display. Further, it comes with two built-in laser pointers to accurately identify the target spot. With a big, easy-to-read display and bright backlight, it is possible to use it even in dim light. It offers a distance to spot ratio of 10:1 and fast power-up response time of 500msec. The feature of adjustable emissivity allows increased accuracy for different materials. You can adjust the alarm from low to high. It holds an ergonomic, rugged, and attractive design and comes with a user manual and 9-volt battery. The product is not designed to measure body temperature, and hence, not suitable for the medical purpose. The Amprobe IR-708 Infrared thermometer is designed to point and shoot for easy and precise temperature measurements. 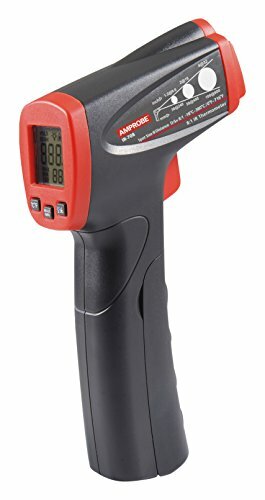 This thermometer comes from Amprobe IR-700 series and is a complete line of high-performance diagnostic tools ideal for numerous applications. You can use the thermometer for residential, electrical, automotive, quality control, fire prevention, home thermal leak detection, industrial maintenance, and other hobbyist applications. It has a bright backlit LCD display that shows the minimum, maximum, and current temperature. It works on non-contact temperature measurement functionality, and hence, can measure temperatures accurately without touching the object. With a distance to spot ratio of 8:1, it has fixed emissivity at 0.95. You can select temperature measurements between Degree Celsius and Degree Fahrenheit. It comes from a 65 years old trusted brand in a rugged, reliable, and durable design. The product complies with the latest CE and IEC safety regulations and has undergone rigorous testing to ensure the quality is unmatched. Another great infrared thermometer in our list is the Etekcity laser grip thermometer. It comes with a distance to spot ratio of 12:1 and precisely measures objects at greater distances compared to other infrared thermometers. But in order to get the best results, you must ensure that the distance between an object and thermometer is approximately 14.17 inches. The thermometer measures temperature ranging from -58 Degree Fahrenheit to 1022 Degree Fahrenheit or -50 Degree Celsius to 550 Degree Celsius. It comes with a built-in laser that offers great precision to hone the exact space you wish to measure. With a versatile design, the thermometer is handy to measure the surface temperature of numerous objects particularly temperatures below freezing points and above boiling points. You can use it when you are barbequing, cooking, doing home repairs, performing auto maintenance, and carrying hosts of other tasks. The LCD screen has a backlit and also features an auto-off function to extend battery life. It even features a low battery indicator so that you never accidentally run out of its use. The body is not much durable. 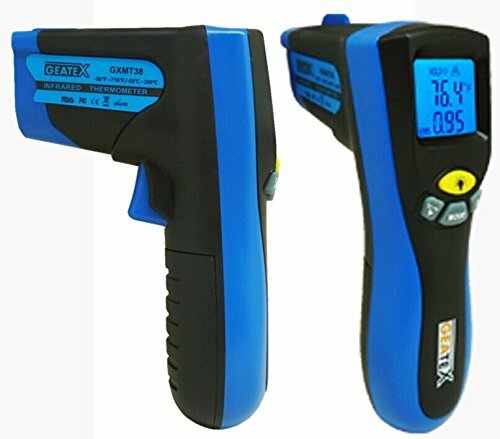 The Raytek non-contact infrared thermometer is an indispensable tool for diagnostics and automotive troubleshooting. The thermometer offers quick non-contact temperature readings, which make it convenient to spot cooling system issues, identify A/C performance, engine misfires, verify catalytic converter operation, and more. It is incorporated with laser point sighting that helps to carry direct measurements toward the target. The big backlit display shows both maximum and current readings simultaneously. Furthermore, it has a protective boot offering added durability. The efficient, award-winning ergonomic design makes it a perfect model to carry infrared measurements for hazardous substances. It offers excellent accuracy and can measure temperature in Celsius as well as Fahrenheit. With a response time of less than 500msec, it has a distance to spot ratio of 12:1 and comes in a beautiful storage pouch, which makes it easier to carry. It is not suitable for industrial or home applications. Does not automatically shut off when not in use. 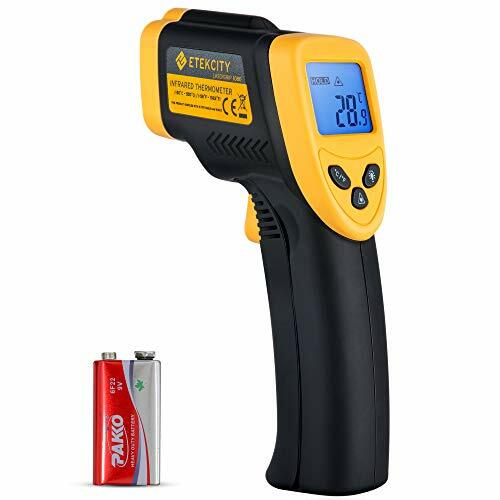 This infrared thermometer is based on the dual laser technology principle that conveniently measures temperature without coming into contact with any surfaces. It allows measuring extreme low or high temperatures. It comes with a powerful mode button and can display minimum, maximum, and average reading. It is possible to measure temperature units in Celsius and Fahrenheit. It has a LOG function, lock mode, low and high alarm settings that are easily accessible. Further, the product features an intelligent temperature alarm function. The thermometer shows blinking icons and an alarm beep on the LCD display. Hence, you are instantly able to know the temperature range that is being measured. Another great feature is the automatically shut off functionality. It automatically shuts off in 7 seconds of non-operation to save power. It comes in an ergonomic handle and compact design that makes it easy to use and store. It is very convenient and simple to use. You just have to point, aim, and measure the temperature. Easy to Use: Aim the laser on the temperature gun to the place where you want to measure a temperature. Stand as closely as possible to the object for the most accurate temperature, Pull the trigger to view the temperature reading on the digital display on the infrared thermometer. 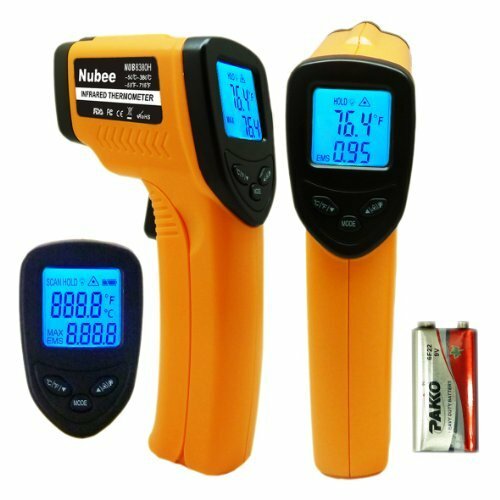 The Nubee 8380H infrared thermometer is the next best product in our list. The thermometer is ideal for various usages and can serve multiple applications, like barbequing, kitchen cooking, and mechanical equipment, car cooling systems, electrical equipment, hot spots, oven temperature, and more. The thermometer offers safe and precise measurements. It comes with a distance to spot ratio of 12:1. It can measure temperature precisely at one-inch diameter spot. Moreover, it can measure the maximum temperature range and can take the highest temperature of the area testing by scanning. The thermometer comes with EMS adjustable function. Hence, it ensures that the temperature measurements are more accurate for different articles. You only have to aim the target in order to measure the temperature. You can stand as close as possible to the surface or object for more precise temperature. You have to pull the trigger to view temperature readings on the digital display on the infrared thermometer. It is not meant to be used for medical purpose. 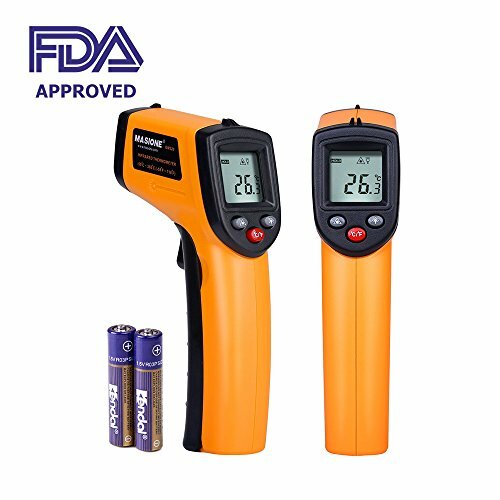 With unmatched multi-functionality and sophisticated design, this is an excellent digital laser infrared thermometer ideal for home and industrial use. The thermometer is extremely handy. It delivers versatile uses and consistent performance for instant temperature readings in performing air leaks, auto maintenance, and barbequing, testing refrigerator temperatures, carrying home repairs, cooking, and host of other jobs. 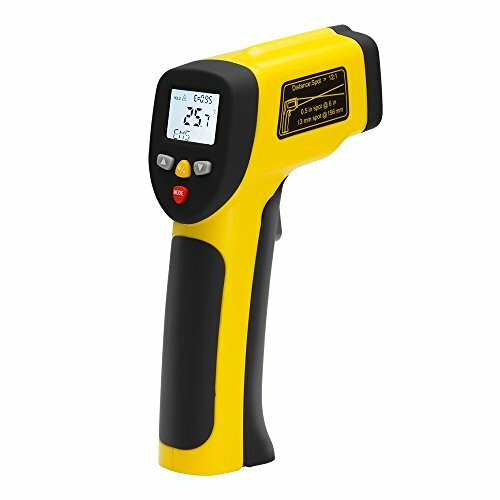 This infrared temperature gun can help you get accurate temperature readings instantly in the range of -50 to 380 degrees Celsius. It is a portable tool that can be used in various applications like making soap, playground equipment, making candles, determining refrigerator temperature, baking, making candy, brewing beer, finding air leaks, and more. The LCD screen display with backlight makes it extremely easy to read the temperature readings. The display automatically shuts off when the battery is low. The device is safe and durable to handle. It can measure temperature safely without surface contact. It comes with 2 x AAA battery with an approved 1-year warranty. The emissivity is set and you cannot adjust it to measure temperatures of different substances. With an excellent ability to measure inaccessible or hazardous objects with ease, the Geatex thermometer ranks tenth in our list. Though it ranks lasts in our list, this does not imply that it is less efficient than others. The thermometer offers accurate readings over an extensive range of temperatures, ranging from -58 to 716 Degrees Fahrenheit. You can easily measure high temperatures and temperatures of moving objects with it. The thermometer has the ability to eliminate contamination and mechanical effect on the target. It showcases both the maximum and current temperature on the bright backlit LCD display. It comes in a rugged and advanced ergonomic design that makes it suitable for all industrial applications. It is a non-contact infrared thermometer that measures temperature quickly. From HVAC service, food preparation, electrical troubleshooting, automotive diagnostics, and hobbies, the thermometer is useful for all the applications. It comes with EMS adjustable functionality that makes the measurements more accurate. There are different types of infrared thermometers available that have varying features. But there are some features that are common to most of them. An LCD screen display is an important feature where the temperature readings are displayed. In addition to this, the thermometer must have data logging abilities where it is possible to record the readings. The other feature is the ability to measure emissivity and laser sighting. Each infrared thermometer is designed for a specific purpose. Some are useful for medical uses, some for industrial uses, and some are used to determine the temperature of hot surfaces or objects at a distance. Hence, you must select an infrared thermometer based on your purpose. These thermometers are used for a range of tasks. From medical use to industrial applications, the temperature range you want depends on what kind of thermometer you need. Most of the general models have a range of at least -50 Degree Celsius to 380 Degree Celsius. While there are advanced professional-grade thermometers that can scan temperatures of up to -50 Degree Celsius to 750 Degree Celsius, you can always go for the basic models, if they are able to meet your requirements. Infrared thermometers can measure external temperatures. The emissivity is related to the reflectivity of the surface being scanned. The infrared thermometers featuring a fixed emissivity of 0.95 is perfect for reading common solid surfaces such as walls, pipes, metal, and more. Fixed emissivity can result in issues when scanning reflective objects like oily, glass, or liquids. Hence, it is best to buy professional – grade models offering variable emissivity as they would allow you to calibrate thermometer for every surface you are scanning for the most precise readout. It is the distance at which infrared thermometer scan temperature from a one-inch area. For example, a thermometer with 12:1 ratio implies that it scans a one-inch spot when held at a distance of 12 inches from the target surface. Pick a thermometer that can cater your need in the best way. All thermometers recommended in our list offer accurate and quick results. There are advanced thermometers available for professional use that offer accurate results due to adjustable emissivity and better IR sensors. You can pick an infrared thermometer based on the level of precision you require. Lastly, it is essential to consider the price of an infrared thermometer before buying it. But make sure you consider buying a thermometer that incorporates at least all the basic features. It is because only such a thermometer would be able to serve your needs. If you are searching for a device with high accuracy in temperature readings, then an infrared thermometer is the best gadget for you. Such a thermometer offers fast readings from surfaces both distant and near. Also, they have the potential of offering 2 dimensional reading of big areas where the temperature may differ from one point to the other. An infrared thermometer offers effective functionality for both domestic and commercial use. Hence, pick an infrared thermometer from the above list that meets your purpose and that fits perfectly well in your budget.